NEWS is just breaking that a giant of 68 lb 1 oz may well have taken the British carp record at the start of 2016. Full story will appear in Angler's Mail magazine. 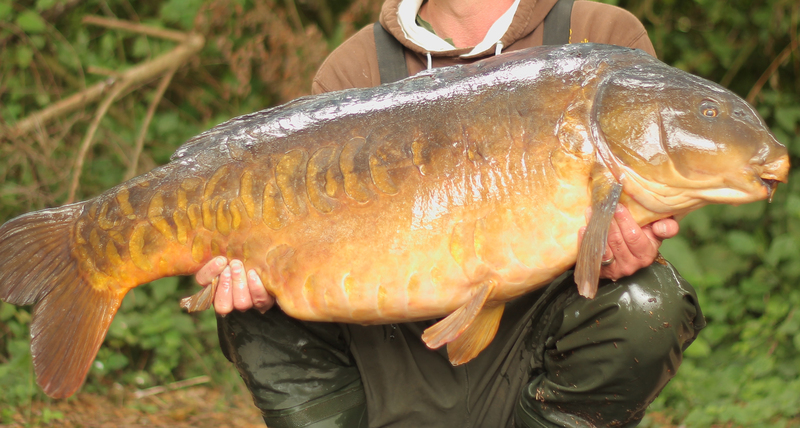 TWO TONE’S dominance as the UK’s biggest carp continued after the mighty mirror surged to a record weight of 67 lb 14 oz. Captor Austin ‘Oz’ Holness smashed the British record when he connected with the big one at Mid-Kent Fisheries’ Conningbrook Lake. The 67 lb 14 oz weight – still reported on many websites and some publications, was later reduced to 67 lb 8 oz after scales checks. And to this day it remains top of the charts… just! You have to go all the way back to Kevin Cummins’ capture of Mary at 56 lb 6 oz, from Wraybury No.1 pit in Berkshire back in 1998, to find any British record-holder other than the Kent venue’s leviathan. Oz, 36, from the same county, eclipsed the current official record held by Simon Bater at 65 lb 14 oz landed in 2005 and John Bird’s catch of Two Tone at 66 lb 15 oz. Rather than opting for little if any bait, a tactic that has seen Two Tone on the bank on more than one occasion, Oz opted for heavy baiting with Geoff Kemp’s Active Bait Solutions GNZ boilies. Oz told the Mail: ‘I like to use plenty of bait as these tactics done alright for me in the past. ‘I’ve been fishing ‘The Brook’ for the past 16 months and have got through loads of bait. ‘During this time I’ve had 21 carp including many of the other named fish. And as I clocked up the bites my hope of the next one being the big ‘un grew. ‘He came on the second day of a 48-hour session. I had found a nice silty spot between two large weedbeds in area called Perfume Bay. ‘I had a couple of liners over the session and there was a proper movement of water, yet the majority of fish seemed to be down the other end of the pond. ‘The take was a stuttery three bleeps and then a belting one-toner. ‘The fish hit the surface early but it was a bit of stalemate and he soon got his head in the weed. ‘We called for the boat and me and my mate Marshy, edged our way towards the fish. ‘Once there I started clearing the weed from the line when all of a sudden there sat this huge tail and I knew there and then it was Two Tone. ‘The fight was pretty hectic as I played the fish to the boat five or six times but it kept powering away. STOP PRESS NEWS – JANUARY 2016! Two Tone looks to have been beaten by a mighty mirror of 68 lb 1 oz – one which was edging ever bigger during 2015 and is called The Parrot (click here to read about the fish). Full story and exclusive coverage will appear in Angler’s Mail magazine. CAUGHT A BIG FISH? Email pictures to anglersmail@timeinc.com – you may appear in the weekly Angler’s Mail magazine, which includes a new Carp Crew section.